*Upstate NEW YORK tends to be a fairly conservative place – not just politically, but when it comes to radio ownership, too. So it’s a big deal when a week brings sales of not one, but two significant station clusters that together span a territory from the Pennsylvania border north almost to Lake Ontario. That goes double when both of those owners are new to the radio business in the region, as indeed they are. We start in Elmira, where we’ve spent much of the last few years chronicling the aftermath of the bankruptcy of longtime owner Robert Pfuntner. Pfuntner’s been trying for several years now to sell off some combination of his assets in Elmira, Bath, Olean and Salamanca to satisfy his creditors. Last October, Pfuntner had a $2.75 million deal lined up to sell the Elmira and Bath stations to ad agency owner (and former WETM-TV manager) Randy Reid, but despite entering into an LMA with Reid’s Titan group, the deal never closed and the stations went back on the market. Reid ended up joining with a competing station group, Community Broadcasters, to file a petition that halted the next sale proposal, which would have sent the Elmira and Olean/Salamanca stations to Bill Christian’s Great Radio LLC for $950,000. The latest attempt to sell the Pfuntner station doesn’t come with any of the ownership-cap concerns that halted the Christian deal. Unlike Christian, who owns Fox affiliate WYDC-TV and has spousal ties to the Sound Broadcasting cluster based in Corning, new buyer Gordon Ichikawa has no broadcast holdings at all, at least where licenses are concerned. But while “Gordy” Ichikawa may be new to station ownership, he’s a well-known figure in the Southern Tier broadcast community for another reason: in addition to a long-running two-way radio business, he owns several of the tallest towers in the region, including the Higman Hill tower above Corning that’s home to most of the TV signals in the Elmira/Corning market and several towers on Ingraham Hill above Binghamton. As of August 1, Great Radio’s LMA with the Pfuntner stations has been replaced by a new LMA with Tower Broadcasting that will run until the stations are finally sold. In his new role as a station owner, Ichikawa enters one of the most crowded radio markets in the region. With a huge chunk of broadcast revenue already going to TV (especially powerhouse WETM), what’s left for radio is divided up among Community’s three FM/two AM cluster, Sound’s four FMs and two AMs and Equinox’s two FMs, in addition to Tower’s new group – plus more signals in Hornell and Bath that eat into the Steuben County end of the sprawling market. For now, at least, Pfuntner remains in control of the Bath stations, AC WVIN (98.3) and sports WABH (1380), as well as WZKZ (101.9 Alfred); the stations in Olean (WOEN 1360/WMXO 101.5) and Salamanca (WGGO 1590/WQRS 98.3) are awaiting closing on their $275,000 to Paige Christian’s Sound Radio. *But the Elmira sale isn’t the only bankruptcy-induced cluster changing hands this week. *The end to one of the biggest “what-if” scenarios in NEW YORK radio came quietly late last week, when Cumulus Media and Clear Channel came to terms on a new agreement that will keep Clear Channel’s Rush Limbaugh on the big former ABC/Citadel talk stations now owned by Cumulus in major markets such as Chicago, Dallas/Fort Worth and Washington. But while Rush won’t move from legacy affiliates including WLS, WBAP and WMAL (not to mention smaller Cumulus outlets such as WXLM 980 in Groton, Connecticut), the deal between Cumulus and Clear Channel will bring Limbaugh to a new spot on the New York City radio dial beginning in January 2014, as he leaves Cumulus’ WABC (770) after a quarter of a century in favor of Clear Channel’s WOR (710). The reasonably amicable resolution of what could have been an ugly dispute (there are few good options for replacement Limbaugh affiliates in many of the big Cumulus markets) continues a pattern of cooperation between the two big “C” companies: Cumulus’ stations are part of Clear Channel’s iHeartRadio streaming service, while Clear Channel’s stations now take part in Cumulus’ SweetJack daily deal site. *On WOR, Limbaugh’s arrival in the noon-3 PM slot will displace one of the station’s longest-running hosts, Joan Hamburg, from her current noon-2 PM airshift, which in turn opens up some interesting questions about what direction the daily WOR schedule will end up taking. There’s no reason to think John R. Gambling’s morning show is going anywhere (and we note here the death on August 17 of Gambling’s mother, Sally, at age 83; she was also, of course, the wife of John A. Gambling, John R.’s predecessor on the WOR morning shift.) What’s less clear, though, is whether Hamburg’s show will move into the 10 AM-noon slot now occupied by Mark Simone. If Hamburg does go to mid-mornings, where her service-oriented show would be an odd lead-in to Limbaugh’s politics), Simone would likely return to the fill-in/weekend duty he’d been doing for years at WOR and before that at WABC. *The week’s other top story came from MASSACHUSETTS, where Entercom’s WEEI was back in the headlines for a second week running as the Boston Celtics announced they’d broken off negotiations to renew the deal between the team and the station. The Celtics and Entercom had been together for eight years, first on WRKO (680) and then on WEEI since 2008. But while the team was in a strong negotiating position back then, winning its most recent NBA championship in 2008, there’s been quite the turnover since then, with the Celtics now staring down what looks to be a string of rebuilding years before they’re once again contenders. *We can say with some certainty that wherever the Celtics land, it won’t be Emerson College’s WERS (88.9 Boston). But even without sports play-by-play, WERS is making dramatic changes to its evening lineup. With no notice last week, WERS pulled two of its longest-running specialty shows off the air in favor of additional hours of the AAA format that’s becoming the station’s focus. “Rockers,” WERS’ daily reggae show, traced its history back to the 1970s and an Emerson student named Doug Herzog who’d go on to run MTV; “88.9 @ Night,” which followed “Rockers” on weeknights at 10, was one of the Boston area’s premiere venues for hip-hop music in a market where urban formats were very slow to arrive on the FM dial. This latest change comes on the heels of another controversial move at WERS, the recent addition of the station’s first paid staffer, morning host George Knight, and it’s raising some as-yet-unanswered questions about what Emerson’s long-range plans for its potent radio voice might be. While plenty of colleges and universities have sold off their student radio outlets in recent years, perceiving a lack of student interest and an increasingly off-core expense, Emerson is rather a different animal. As arguably the most prominent training ground for New England broadcasters today, WERS is unquestionably a core part of Emerson’s mission, and we’d think it would remain essential for students to continue to be right at the center of its on-air product. *In addition to the big news from the big city, our NEW YORK news includes an impending format change in Binghamton, where Equinox Broadcasting is completing a flip that began with its surprise decision back in June to move oldies “Cool” from WCDW (100.5 Susquehanna PA) to the bigger signal that had been AC “Q107” WRRQ (106.7 Port Dickinson). Since the flip in June, “Cool” has been simulcasting on both the 106.7 signal from the main Ingraham Hill tower farm and the rimshot 100.5 signal, a class A from a site east of Binghamton in Windsor, NY. Last week, though, Equinox moved callsigns, turning 106.7 into WCDW and putting the calls WDRE (famous from earlier stints on alternative stations on Long Island and in Philadelphia) on 100.5. That call swap is tied into a flip that has moved the alternative “Drive” format to 100.5 from its initial home on Equinox translator W283AG (104.5 Binghamton) and one of 106.7’s HD subchannels. *In CANADA, Montreal’s newest TV station has begun testing. CFHD (Channel 47) will be multicultural “ICI TV” (International Channel/Canal International) when it signs on, at least if it can resolve a touchy trademark dispute with CBC/Radio-Canada, which still plans to use some sort of “Ici” branding on its French-language services beginning this fall. The new station, led by Sam Norouzi, plans to launch for real in late September or early October, reports Montreal media maven Steve Faguy, who says CFHD will feature some programming from OMNI, the multicultural network owned by Rogers that was formerly aired on CJNT (Channel 62).The introduction of CFHD was part of the deal that allowed CJNT to be relicensed as a full English-language commercial outlet of Rogers’ City TV service – and today marks the launch of the first daily City program in Montreal, “Breakfast Television” from 6-9 AM. 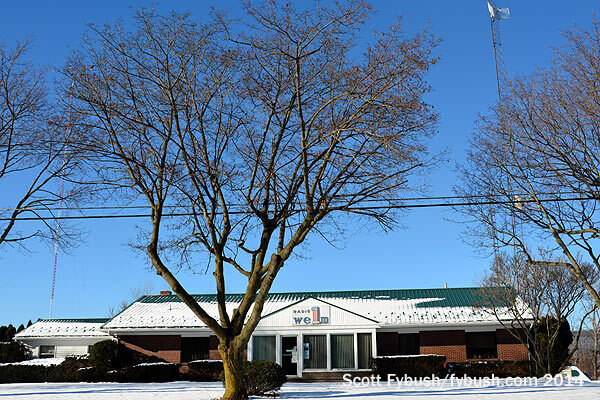 Two station sales lead our NEW YORK news, beginning in Syracuse, where Buckley Broadcasting is exiting the market with the sale of its classic hits pair WSEN-FM (92.1 Baldwinsville)/WSEN (1050 Baldwinsville) and oldies WFBL (1390 Baldwinsville). While rumors about the impending sale of the stations had been swirling for a few months, the identity of the buyer came as a surprise: it’s James Johnson’s Leatherstocking Media Group, which just closed on nearby WMCR/WMCR-FM (1600/106.3 Oneida). Leatherstocking will take over operation of WSEN/WFBL under an LMA on September 1; the transaction hasn’t yet been filed with the FCC, so we don’t yet have a purchase price to report. The addition of WSEN/WFBL to the Leatherstocking group puts Johnson into some stiff competition – unlike Oneida, where WMCR pretty much has rural Madison County to itself, the Syracuse stations face off against national players Clear Channel and Citadel, as well as two other local players, Ed Levine’s Galaxy cluster and Craig Fox’s stations. Speaking of Fox, he quietly flipped formats on his latest acquisition a couple of weeks ago: WVOA (105.1 DeRuyter) is now carrying Radio Disney, also heard on Fox’s WOLF (1490 Syracuse)/WWLF (1340 Auburn)/WAMF (1300 Fulton). The “Love Radio” religious/ethnic programming that’s been heard on 105.1 in two incarnations is again being heard exclusively on WVOU (103.9 Mexico). In MAINE, Hearst’s WMTW-TV (Channel 8) is hoping to return to the dials of viewers using UHF-only antennas to receive digital TV – it’s applying for a digital replacement translator in Portland on channel 26 (the old analog home of MPBN’s WMEA-TV). The new translator would run 6.2 kW from atop the time-and-temperature sign above WMTW’s studio building in downtown Portland. WMTW tells the FCC that it’s still receiving reports from viewers unable to receive its channel 8 signal on indoor antennas, and it says many of those viewers, especially in urban Portland, are in situations where they can’t install outdoor antennas. It was a week of obituaries, and you’ll forgive us, we hope, if we begin our report in NEW YORK and remember one of your editor’s former bosses, Pete Dobrovitz, who died Tuesday (August 17) at 51. And it’s largely Pete’s fault that you’re now reading “NorthEast Radio Watch” and not “New England Radio Watch,” for it was his job offer in late 1996 that moved me from Boston’s WBZ to R News. Ironically, Pete was gone from R News just days after my arrival, the result of a disupte over editorial independence, a recurring problem in a newsroom owned by a cable company with no real experience in doing news. Another obituary this week comes from Buffalo, where Warren P. Smith, Jr., known to viewers and listeners as “Clip,” was killed Saturday (8/21) in a car crash in Niagara County. Smith began his broadcast career in the sixties at WUSJ (now WLVL) in Lockport, then went to Buffalo’s WKBW-TV (Channel 7), where he did sports from 1971 until 1988. From there he returned to radio, working at WGR (550) for a decade and then at WBEN (930) until his job was eliminated in a cost-cutting move in 2002. Smith was also active in politics, running for mayor of Lockport and serving on both the city council and the school board there. Clip Smith was 63. A veteran of the NEW HAMPSHIRE broadcast scene has died. Maury Parent was closely associated with both of Nashua’s AM stations over the years, first at WOTW (900/106.3), then moving over to WSMN (1590) when WOTW went dark in the eighties, then returning to the revived AM 900 under its later incarnations as WMVU, WOTW and WSNH. (Most recently, he was hosting the morning show on WSMN.) Parent served as GM of both stations at one time or another, but was probably best known for his weekend show that served the area’s large Francophone population. (It’s heard on WSNH.) He was on his way to a remote Thursday when he suffered a heart attack and died behind the wheel; he was 72. A PENNSYLVANIA radio station owner will go to trial on charges that he molested a young boy. A judge upheld all of the 19 counts against Doug Lane, owner of WWDL (104.9 Scranton)/WICK (1400 Scranton)/WYCK (1340 Plains), last week. Lane is free on bail while his case is being heard. Over on the other end of the state, Corry Broadcasting’s WEYZ (1530 North East) is changing hands. It’s now WYNE, and it’s simulcasting Mercyhurst College fine arts outlet WMCE (88.5 Erie) – though former sister station WWCB (1370 Corry) continues to ID “WEYZ North East” at the top of the hour, too! Up the coast, some sad news to report from Rockland, where WMCM/WRKD owner Peter Orne Sr. died this week in the crash of the private plane he was piloting. Orne grew up in Rockland, attended Bowdoin College, and went into TV sales and management, eventually ending up at WTNH in New Haven, then as general manager of WVII in Bangor, a post he left to go into radio ownership (at one time including WABI/WWBX Bangor in addition to the Rockland stations). Orne’s son, Peter Jr., takes over management of WMCM/WRCD. Peter Orne Sr. was 64. A memorial service will be held Saturday. Across the border in NEW HAMPSHIRE, there’s one station sale to report and another possibly on the way, as Tele-Media moves into the Granite State by buying Clark Smidt’s oldies WNNH (99.1 Henniker) in the Concord market. Smidt stays on with the new owners as “director of procurement for New England.” Tele-Media (which northeast listeners know from the Albany WABY/WCPT/WKLI group) is reportedly looking at Nashua’s WHOB as its next acquisition — but we’ve heard that station mentioned in enough rumors to stock an entire issue of Inside Radio! Don Imus switched MASSACHUSETTS affiliates on schedule Monday, with WSJZ (96.9 Boston) taking over from WEEI (850) (and from Worcester’s WWTM, which also loses the I-man). Departing WSJZ PD Shirley Maldonado sent out an e-mail farewell to the station’s mailing list this week, mentioning the Web as the only local source for smooth jazz all day (with sister station WMJX offering a few hours on Sunday mornings). Up in Middletown (well, “down” in Middletown from our perspective, actually), Crystal Communications is making some big changes at WALL (1340), as the station’s local programming gives way to a relay of WEOK (1390) in Poughkeepsie. Morning host John Moultrie was to have remained on WALL until next Friday (9/3), but after he voiced his opinions on the changes a bit too loudly, the plug was pulled a bit early. Also leaving is polka guy Jimmy Sturr, who returns to nearby WTBQ (1110 Warwick). Speaking of WTBQ, which we really should do more often, Dale Anderson is departing as news director to go home to New Jersey. OM Chris Cordani will fill in for now. And former morning guy Rob McLean rejoins the station as evening jock. Pesky reader noticed a typo-The Calls on Townsquare Media’s Kingston NY Country station are WKXP. I thought Pamal was going to donate WGHQ to Robin Hood Radio. 6 Johnson Road is still on the license. There is no application to transfer listed on the FCC webpage, nor one to downgrade the signal. With both US senators and the vast majority (20 vs 7) of US House members in the Democratic Party column, just how is New York politically conservative, as you assert? Scott said “Upstate New York” — which is practically a different state from the NYC area that dominates the state’s electoral politics by dint of population. Have a look at the voting trends for New York Assembly districts — the farther north and west you go, outside of the big cities, they’re all Republicans. Same thing for county legislatures. Western New York is more like Ohio than it is like NYC/Long Island/Westchester.